Of the flock of South American drivers heading to Europe in the late seventies Argentinian Ricardo Zunino was certainly one of the less talented. 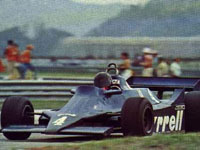 He can at least claim to have won an F1 race, however, taking the 12th round of the 1979 Aurora AFX Championship at Brands Hatch. And he actually didn't do a bad job. At the last of the two North American races Zunino filled in for Lauda he showed promise by qualifying way up the grid in 9th. This led to full-time employment for the team in 1980 but a hard-charging Piquet soon highlighted his shortcomings, so after seven pointless races Ricardo was fired in favour of wealthy Mexican Hector Rebaque, who went on to do marginally better. In 1981 Zunino returned to the major league for two more races on his native continent. But results were non-existent and with young gun Michele Alboreto shopping for an F1 drive, Ken Tyrrell made no qualms in throwing out the Argentinian.